Guitar Making tip No. 14 is about asking a friend who plays guitar for ideas and inspiration for your guitar. If you do not play yourself, it can be yet one more hurtle to understanding what makes a good guitar. Thankfully, if you have a friend that plays, you can just ask them to tell you what they like. There are so many guitars in the world, and there are a lot of ways to make them custom for the individual. In the beginning, you want to add some custom elements for sure, but don’t go nuts. Instead, look at my 25 Simple Ways to Customize Your Guitar Without Altering the Tone, and you can learn some safe places to have fun without wrecking the guitar. When you do add things, or make your guitar a certain way, it needs to be for a reason. If you are just shooting into the wind, you might not hit anything. Instead, ask someone that you know that plays the guitar, and they can tell you what they like. If you don’t immediately know someone that plays, your friends do. Reach out through your friend network and ask for what you need. If you do this, you should find someone in your circle or connected to your circle that can help. Another good way is to just tell your friends that you need the help. Many times, they will know someone that can help right off the top of their heads. Lots of people have a parent or a sibling that plays guitar, and they can introduce you. Social media works too, so reach out and see what comes back. Make sure that you know the person of course, and arrange a meeting with a common friend if you do not. This is how I met a really great upright bass maker, through a common friend. Not all guitar players are alike. Some are really good at knowing what they want, and some are not. Some are very new, and some have been playing for a long time. A little screening in the beginning can be a good thing, and it will help you get better information. A brand new guitar maker will only be able to tell you so much about their preferences. They will still know more than you if you don’t play at all, but it may not be a lot. In cases like this, you can still learn some things, but it will not be as much as a player who has been playing a while. Also, some players are not as good at expressing what they like and don’t. Guitar playing is like any other instrument, and there is a lot of heart involved. Sometimes, the heart just feels things that the mind can’t explain, so it can be hard to make a guitar to replicate those emotional things. If you want good information, you need to get it from a good source. Find someone that has been playing for a while, and that can talk to you about what they like. Ask them some questions over the phone or as an initial interview before meeting. This is how you make sure that they can tell you what they like and don’t like. If you want to have a little fun, you can make an appointment at your shop for the interview. 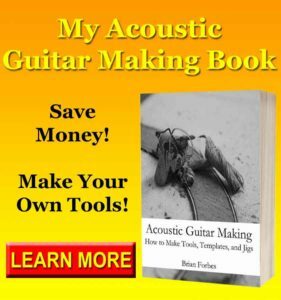 This will allow you to share some of your woodworking stuff as well as them sharing what they know about guitar playing. Working together like this, you will keep your guitar player friend as interested in the process as you are, and they will be excited about giving you information. You should get as much as you can from this session, and if needed book another later in the process. Ask a lot of questions. You should look for answers about weight, scale length, headstock shape, sound quality, bass vs treble, and anything else that they can talk about. All of this information helps you build up and understanding of what a good guitar really looks like. Your friend will love the experience too, especially if you tell them about the guitar making process, and show them how their instrument is made. You can essentially end up entertaining each other for hours, with each of you learning in the process. 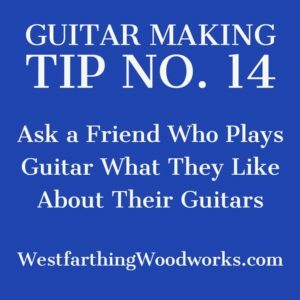 Here are a few more tips in my post, 25 Best Guitar Making Tips for Beginners, and it’s a fun read that can help you make better guitars. If you don’t know about guitars and you are making guitars, try to find someone that you can learn from. This does not have to be anything long or intense, but someone to tell you about what they like about their guitar. This process will give you a lot of good info to work with. The reason for this is you really don’t know what a good guitar should sound like unless you have done some research. Once you know where your target is, you have a better chance of hitting it. Send out something on social media, or start asking your friends and colleagues in person if they know someone that can help. Odds are that someone in your circle can either help you themselves, or they can point you to someone that can. Then, make your appointment. Making a guitar is a long process, and there are going to be some hurtles that you need to overcome to make the instrument. It’s still easier than it looks, but you are going to face some fun challenges, and that’s part of the process. When you know nothing about how a guitar is supposed to sound, your ability to judge things by sound is minimized. Until you do some research and get to know what a good guitar sounds like, you are not as strong of a guitar maker as you can be. Thankfully, the solution is as simple as looking for a friend that plays, and asking them about their guitar. Pick their brain, and find out everything they like and don’t like. Use that information and when you reach a decision point, you will have more ammunition for making a eater sounding and better playing acoustic guitar.